The LG G Flex 2 left the “rumors and speculation” territory moments ago when it was officially announced and detailed at the CES 2015. Unsurprisingly, the smartphone comes equipped with a very similar display to the one that made its predecessor so famous back in 2013. However, this time around LG took it a bit further and made sure that this handset will not fall under the radar like the first iteration did. Specifically, the company decided to offer a slightly smaller screen and a better resolution, both very wise choices if you ask me. As such, the LG G Flex 2 sports a 5.5-inch P-OLED display with 1080 x 1920 resolution, 401 pixel density, and special protective glass that’s said to be 20% more resistant than Gorilla Glass 3 . From a visual standpoint, the phone looks more or less similar to its predecessor, but also burrows a bit from the LG G3 flagship. Aside from the curved display, the other main feature that made the LG G Flex famous returns and has even been substantially improved. I am of course referring to the device’s special coating, which allows the LG G Flex 2 to repair itself in a sense. This self-healing coating is again only available on the back panel, but this time it’s reportedly able to repair scratches in only 10 seconds. The previous model needed about 3 minutes, so that’s quite a big upgrade for the LG G Flex 2. As for under the hood improvements, the device certainly has plenty of those as well, beginning with the new Qualcomm Snapdragon 810 processor. 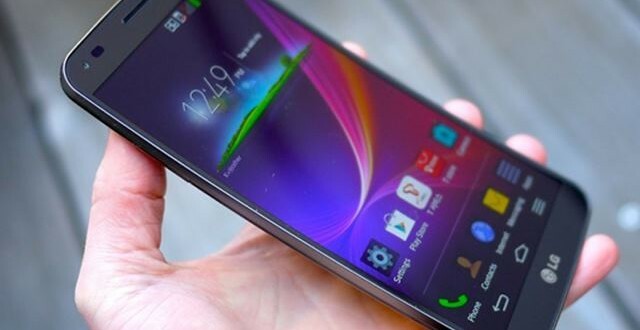 The LG G Flex 2 is the first smartphone to offer the new CPU and LG is undoubtedly having a field day because of it. Some other specs include 2 GB of RAM, 16/32 GB storage options with microSD card support, 13 MP primary camera with OIS+, and 3,000 mAh battery. Pretty good right? All in all, we’re looking at improvements across the board and this also applies to the operating system. The LG G Flex 2 runs straight out of the box on Android Lollipop and will be available in Platinum Silver and Flamenco Red colors. Interested customers in South Korea will be able to get their hands on the device first later this month, but other regions will follow in the near future as well.